We’ve recently received a number of inquiries regarding wind energy agreements. This article, while not offering legal advice, is intended to inform landowners as to some of the key legal issues they should consider when evaluating a wind energy agreement proposed by a developer. According to the American Wind Energy Association, more than 31 percent of Iowa’s in-state electricity generation came from wind in 2015. The Iowa Utilities Board has reported that this is the first time that wind has ever supplied a state with more than 30 percent of its yearly electricity. Sustaining this increase in wind energy output is an increase in wind farm development. When wind farm developers approach landowners about constructing wind turbines on their property, many are left with many questions. Landowners are encouraged to consult with legal counsel and their tax advisors regarding the implications of the agreement they are evaluating. Following are some important considerations. The backbone of any wind farm is the wind energy agreement. Every landowner who sells an easement or leases property to a developer does so pursuant to a detailed contract drafted by the developer. It is important that landowners fully understand the rights and obligations detailed in these contracts before signing them. With many of these agreements dictating land usage for the next 50 years or so, it is well worth the expense of hiring an attorney experienced in these matters to review the paperwork before signing. Given the voluntary nature of these projects to date, there may not be a lot of room for negotiation. Even so, landowners should not be afraid to ask for terms that better meet their needs. And landowners should not hesitate to walk away from negotiations if they are not comfortable with the terms offered. Because these contracts often contain a confidentiality clause, landowners usually don’t know the terms of their neighbors’ agreements. As such, it is sometimes difficult to evaluate the fairness of a financial offer. One sometimes confusing element of wind energy agreements is the nature of the interest being conveyed. Sometimes the agreement will use the term “lease,” and sometimes it will use the term “easement.” Sometimes the agreement will use the terms interchangeably. Many times, the agreement actually conveys a combination of both. While the two interests are similar, they are legally distinct. An “easement” is a right to use a landowner’s property for a specific purpose. Title to the property remains with the landowner, but the purchaser obtains a limited property interest. Because this is an ongoing interest, an easement is recorded in the county land records. It remains binding upon future owners or occupiers for the term of the easement. 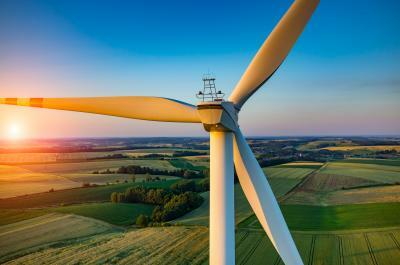 Although an easement can be perpetual, wind energy easements are generally for a term, often between 30 and 50 years. Developers often purchase easements to secure a number of rights, including those for ingress and egress, installing transmission lines and facilities, and accessing unobstructed wind. Called “unobstruction” easements, the latter easement restricts landowners from building or conducting activities on their property that would impact the amount of wind reaching the turbine. An easement is usually nonexclusive, meaning that the landowner may continue to farm or otherwise use the land, subject to the rights conveyed by the easement. Some easements may be temporary. Construction easements, for example, usually allow the developer to travel over a larger portion of the property to build the turbine, but end when the construction phase of the property is complete. A lease, on the other hand, is a conveyance of an interest in land for a term of years in exchange for a rental payment. Without special language in the lease agreement, a lease typically conveys an exclusive right of possession to the tenant. Developers often seek long-term leases for the small parcel of land on which the turbine is located. The nature of the interests conveyed and the way the payments are structured impact the tax treatment of the payments. Landowners are strongly encouraged to consult with the tax advisors before signing a wind energy agreement. This will prevent surprises at tax time. Generally, if a landowner receives a payment in exchange for an easement in place for 30 or more years, that transaction—for tax purposes—is treated like a sale of the impacted property. If the price does not exceed the basis (generally, the cost) of the impacted property, the basis is reduced by the amount of the easement payment, and the landowner recognizes no income from the sale. If the amount of the payment exceeds the basis, the amount of the payment in excess of the basis is taxed at capital gains rates if the landowner has owned the property for more than one year. Payments for short-term easements are taxed like lease payments. Both are taxed at ordinary income rates, not subject to self-employment tax. Payments to compensate farmers for crop damages are taxed as ordinary income, subject to self-employment tax. Because these transactions can be complicated, landowners should always consult with their tax advisors for information on the specific tax implications of any agreement before signing. Another key issue for landowners to consider is liability stemming from the construction and operation of wind towers on their property. Landowners should ensure that developers agree in the contract to indemnify them for damages. This should include defending landowners in future lawsuits and compensating them for legal damages incurred because of the wind farm. The agreement should also require the developer to maintain a sufficient amount of liability insurance to protect the landowner. Landowners should review potential tort liability arising because of a wind farm—including nuisance, negligence, and trespass—with their legal advisors and their own insurers. Acquisition value is the acquired cost of the property including all foundations and installation cost less any excess cost adjustment. Landowners must not enter into a wind energy agreement without first consulting with and receiving approval from any lenders with a security interest in the property or any tenants farming the land. A landowner risks accelerating the mortgage if he or she signs an agreement that inadvertently impacts the rights of the lender. Landowners should also ensure that the wind energy agreement will not restrict their ability to encumber the property in the future. Farm tenants are largely impacted by wind energy agreements. Landowners risk breaching their lease agreements if they enter into a wind energy agreement without the permission of the tenant. While landowners with one-year leases can terminate those leases and renegotiate terms that accommodate the installation of a wind turbine on the property, landlords with multi-year farm leases must engage the tenant in any discussions with a developer. The tenant is in possession of the property for the term of the lease and cannot be displaced. Landowners should consider the impact of the wind farm on future farm tenants as well. Wind energy agreements can also impact farm program payments. If the land is enrolled in the Conservation Reserve Program, for example, the landowner should consult with the Farm Service Agency to determine the impact of the proposed development on the contract. Sometimes developers are interested in buying back contracts or repaying all benefits paid under the contract to release the land from future CRP obligations. Landowners should consult with their advisors to assess any legal obligations stemming from such an approach. Landowners must also carefully consider the impact of a wind farm on their farming or other activities. Wind turbines can, for example, interfere with GPS technology. Although that is becoming less of a concern as technology advances. Turbines can also prevent aerial spraying. Some agreements allow farmers to schedule times for spraying when the turbines are shut down. Landowners must also ensure that they understand the full scope of the rights and obligations created by the contract. How many turbines can be built? Who controls the exact location of the turbine? What building and use restrictions accompany the agreement? These are just some of the many questions for which landowners should seek answers. Landowners should also make sure that the agreement fairly compensates them for ongoing damage incurred because of these restrictions or provides that the developer will timely repair damage to the landowner’s property. For example, the agreement should specify that the developer must repair (within a reasonable period of time) any drain tile damaged because of the developer’s activities. The agreement should also provide for repair and/or compensation for soil compaction and similar types of damage. In an effort to reduce future problems, developers often enter into agreements with landowners owning property adjacent to the wind turbine sites. Although not legally required, these agreements provide for a smaller stream of payments to these neighbors in exchange for refraining from activities that may interfere with the operation of the wind park. These agreements also lessen the possibility of tort litigation down the road. Wind energy agreements typically provide that the developer is responsible to remove the tower (up to a certain depth below ground) when the project ends. Landowners should read these provisions carefully and understand at what point this removal obligation is triggered. This is merely a brief overview of some of the many issues landowners should consider before signing a wind energy agreement. These agreements can provide a stable source of income over a period of many years. They can also increase tax revenue for schools and bring new jobs to an area. However, landowners must understand the long-term consequences of any agreements they sign. Those consequences will impact the landowners, successive owners, and tenants far into the future. Investing in some trusted legal and tax advice before signing such an agreement will likely yield a positive return.